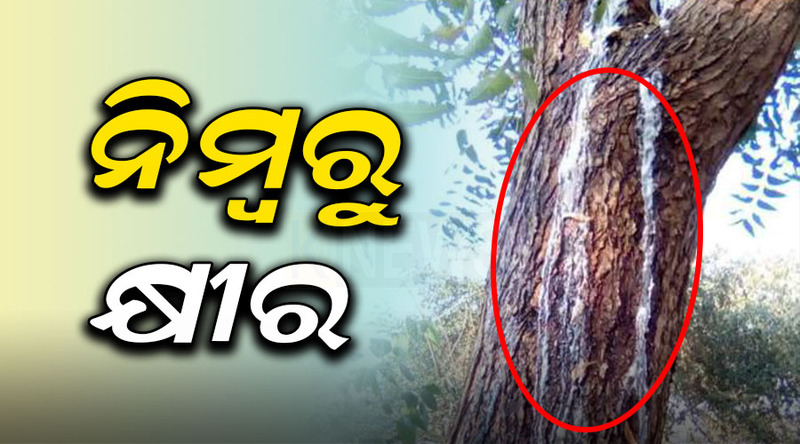 Nayagarh: A supernatural happening has been witnessed in the Karadapada village under Gania block of Nayagarh district in Odisha. Though the taste of neem is known to be bitter, it has been reported that through an unexplainable divine intervention the tree is oozing a milky fluid that is sweet. One Prabhakar Nayak of the village first noticed the happening today morning. He found that a milky liquid was seeping from the referred neem tree. He was dumbfounded at this unnatural and yet Godly occurrence and immediately intimated it to the villagers. The news spread like wildfire and hundreds of locals from the surrounding villages have been gathering near the referred neem tree. Many people in the village have accepted it as an act of God and have started worshipping the tree. Considering the liquid to be holy, people have started furnishing the tree with special prayers and offerings. The ten feet high tree has so far become a centre of attraction where devotees are also doing sankirtan and lighting lamps in the name of God to get blessings.